Georgia’s State Parks are gearing up for the biggest stellar show that most of us will ever see. For the first time in nearly 100 years, a total solar eclipse will make its way across nearly the entire United States. The “path of totality” – where day will briefly turn to night – includes northeast Georgia State Parks such as Black Rock Mountain and Tallulah Gorge. Our Eclipse 2017 webpage has all the information you’ll need on viewing spots, accommodations, events and safety tips. Park gift shops will sell viewing glasses and memorabilia. So, pick a park, pack your viewing glasses, and get ready for an experience of a lifetime! Looking for a summertime challenge? 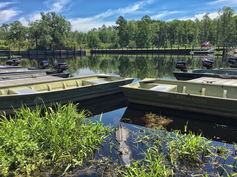 Join our Park Paddlers Club and you’ll explore six beautiful waterways, from the marshes of Crooked River to the mysterious Okefenokee Swamp. Get your membership card punched after paddling each trail and you’ll earn a Park Paddlers Club t-shirt. Kayaks, canoes and stand-up paddleboards are available for rent at many state parks, and visitors can bring their own as well. 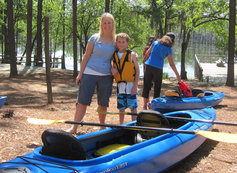 Find more paddling adventures for the summer. Did you know America’s first gold rush began in Georgia, not California? Twenty years before the famous 1849 discovery, thousands of prospectors flocked into the Cherokee Nation in north Georgia. Dahlonega thrived and a U.S. 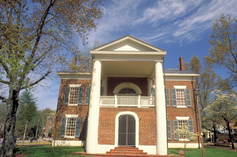 Branch Mint opened in 1838, coining more than $6 million in gold before closing in 1861. The story is now told at Dahlonega Gold Museum Historic Site, housed in the former Lumpkin County Courthouse. You’ll see rare coins, a nugget weighing more than five ounces, a large hydraulic cannon, and film with historic footage. You’ll want to spend a few days because the town of Dahlonega is filled with great restaurants and shopping (including the museum’s gift shop).